This past Monday Buckingham Palace officially announced the engagement of Princess Eugenie of York to Mr. Jack Brooksbank. It seemed only fitting that this week’s Royal Wedding Wednesday should cover Royal Engagement Rings and Portraits. The happy couple will marry at St. George’s Chapel in Windsor Castle later this year in the fall. 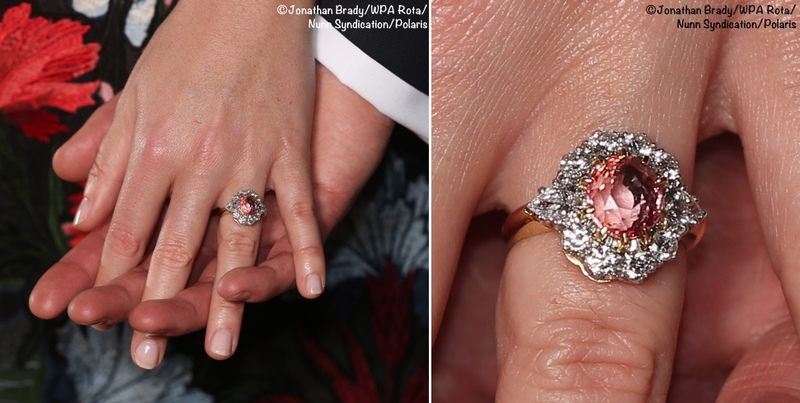 Princess Eugenie’s engagement ring features a padparadscha sapphire. It is a blush colored stone that is extremely rare. Many people pointed out that the ring is quite similar to the ruby ring her father, Prince Andrew, the Duke of York, gave to her mother, Sarah Ferguson, the Duchess of York, in 1986. There are definite similarities to the Duchess’ ring. It is said that Prince Andrew chose the Garrard Jewelers gem to match his fiancée’s fiery hair. 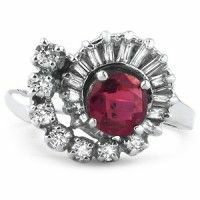 The ring featured an oval Burmese ruby flanked by ten diamonds. 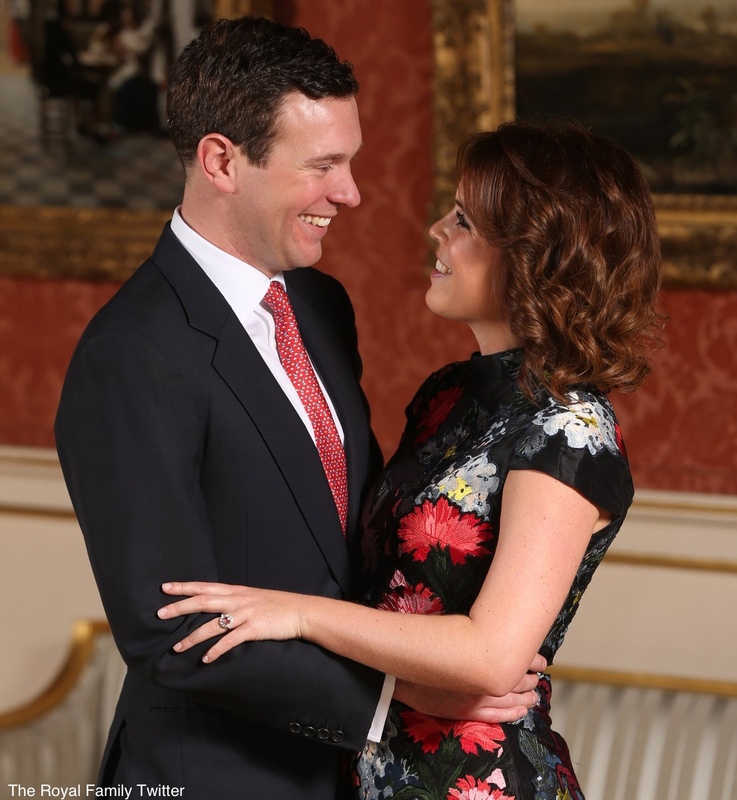 Princess Eugenie and Jack’s official engagement portrait took place in the picture gallery at Buckingham Palace. The bride wore a dress by Erdem and Jimmy Choo shoes. With the release of Princess Eugenie’s official engagement photos, the British press immediately began comparing them to the official photo’s taken of Prince Harry and his American fiancée, Miss Megan Markle, just last month. Many were shocked that Miss Markle chose such a sheer gown given that the Royal family generally dresses fairly conservatively for official portraits. The $75,000 price tag of the Ralph & Russo gown also raised some eyebrows. But Miss Markle, a successful actress, can afford such a dress. Prince Harry designed the engagement ring and it was executed by the jeweler Cleave and Company. A diamond from Botswana is the center stone. It is flanked with two diamonds from Princess Diana’s collection. Prince Harry’s brother, Prince William, the Duke of Cambridge, presented his fiancée, Catherine Middleton, his mother’s iconic engagement ring. For their 2010 official engagement portrait, the Duchess of Cambridge chose to wear a $300 off the rack three quarter ivory sheath by Reiss. The stunning 18-carat oval sapphire surrounded by 14 diamonds was made by Garrard Jewelers. It originally cost $36,000 in 1981. It is now priceless. Prince Charles and Lady Diana Spencer announced their engagement in London on Feb. 24, 1981. Their official engagement portrait was quite traditional. 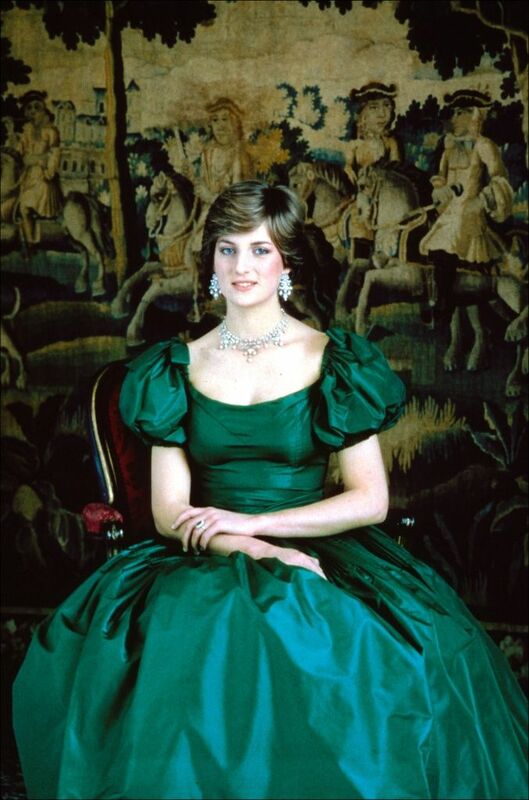 Even all these years later I am still enchanted by her Nettie Vogues emerald green taffeta ball gown. 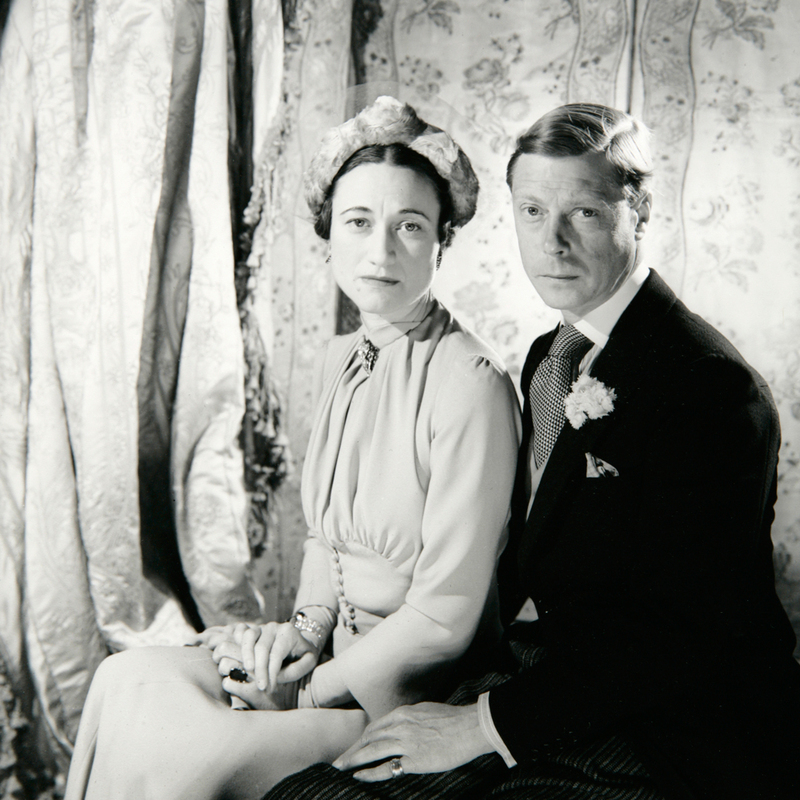 This portrait was taken at Highgrove by Lord Snowdon, the husband of Princess Margaret, the Queen’s sister. 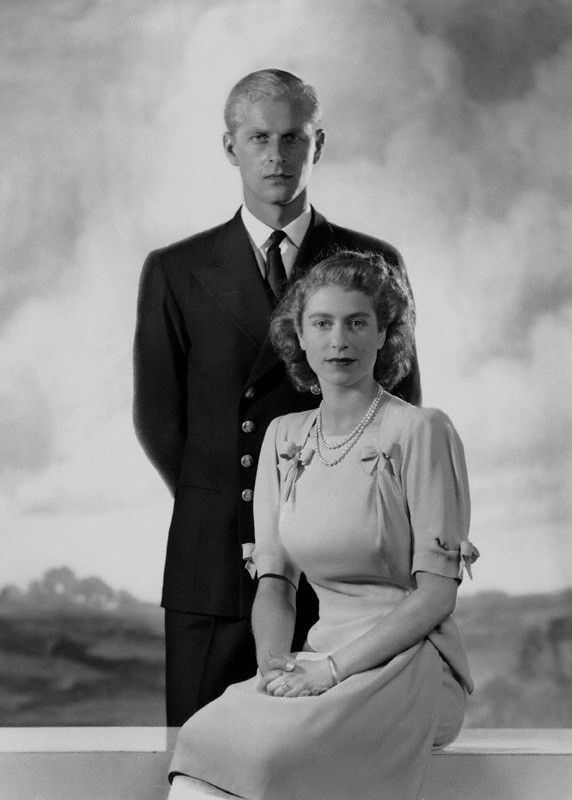 If you are watching season two of “The Crown” you already know he was a brilliant photographer. The diamond Girandole earring and necklace set she wore was on loan from Collingwood jewelers. 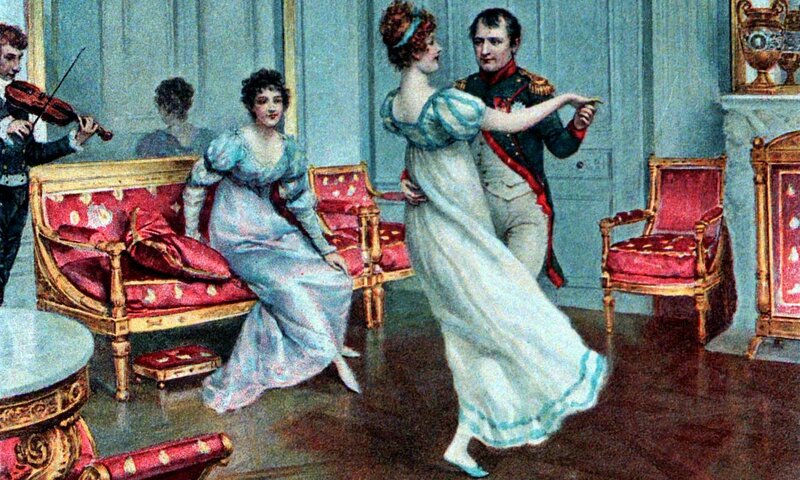 It was quite the controversial move back then as the Royal family did not “borrow jewelry”. Collingwood wanted to gift Lady Diana the set but the palace encouraged her to decline which she did. 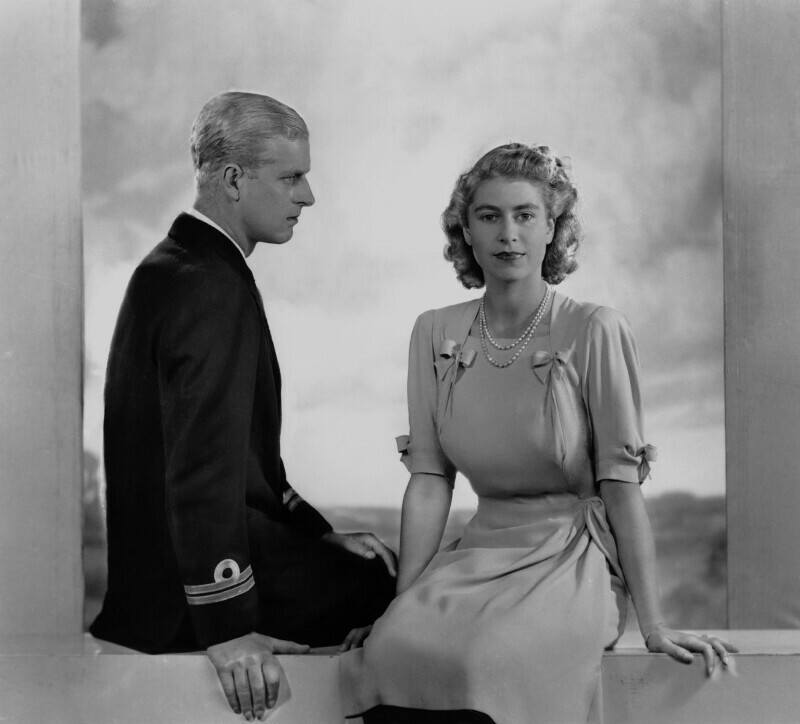 Prince Philip proposed to Princess Elizabeth in 1947. The ring was a simple three-carat solitaire with smaller diamonds on each side. The diamonds for the ring came from a tiara belonging to Philip’s mother, Princess Andrew of Greece. 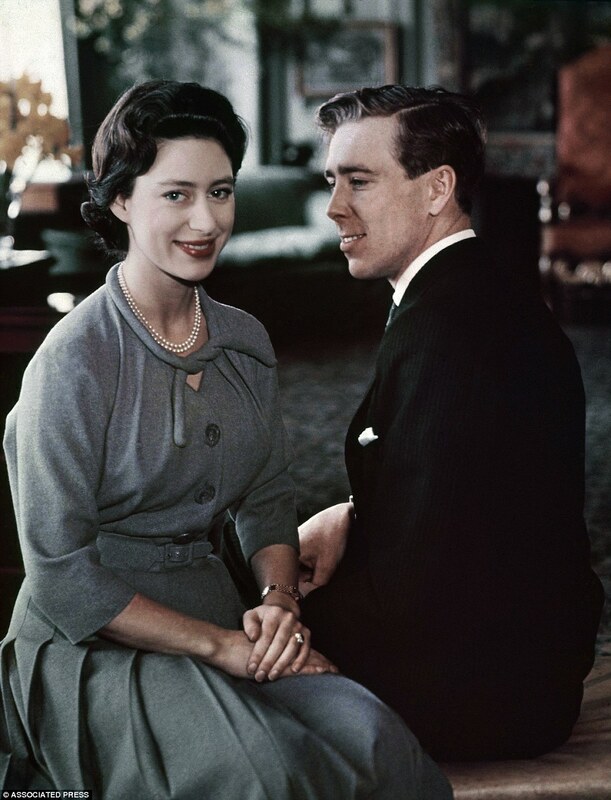 Her sister, Princess Margaret, announced her engagement to Antony Armstrong-Jones in 1960. Armstrong-Jones designed the lovely ring. The center ruby is surrounded by diamonds. 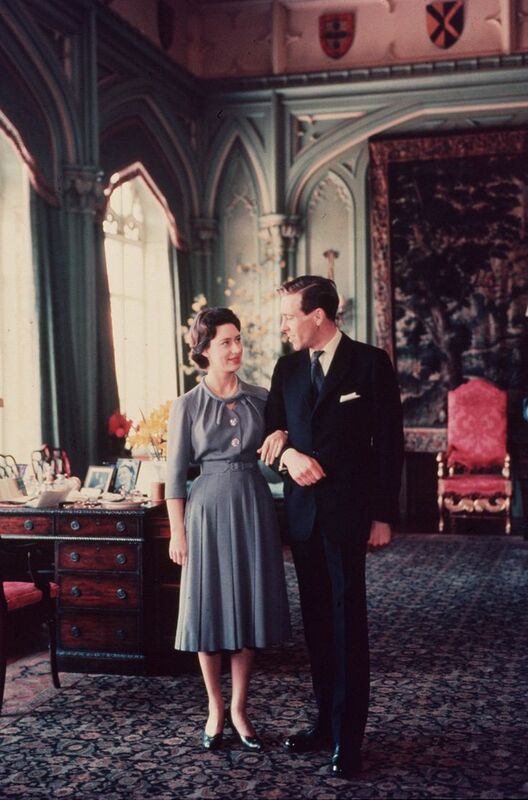 The rosebud design was a nod to Princess Margaret’s middle name, Rose. 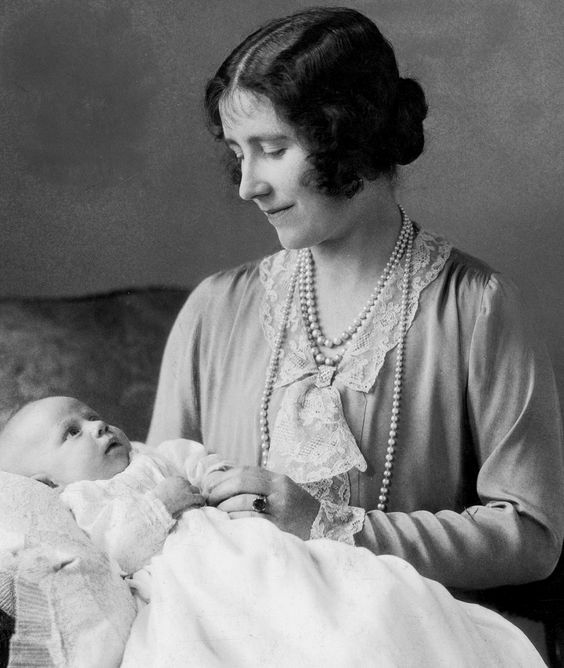 Their mother, Lady Elizabeth Bowes-Lyon, never expected to become queen when she finally accepted the proposal of the Duke of York in 1923. The Duke presented her with a simple sapphire and diamond ring that you can slightly see in the image below with Princess Elizabeth. She became Queen when her brother in law, King Edward VIII, abdicated the throne to marry the twice-divorced American, Wallis Simpson. 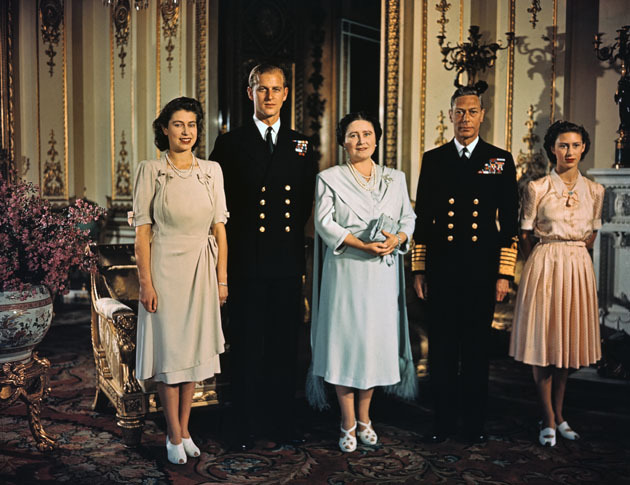 Thus making her husband King George VI. The Duchesses 19.77-carat emerald engagement ring bore a personal inscription that read: “We are ours now 27 X 36.” It was a reminder of the day Edward proposed, October 27, 1936. Queen Elizabeth’s great-great-grandmother, Queen Victoria, wore a somewhat unusual engagement ring by today’s standards. 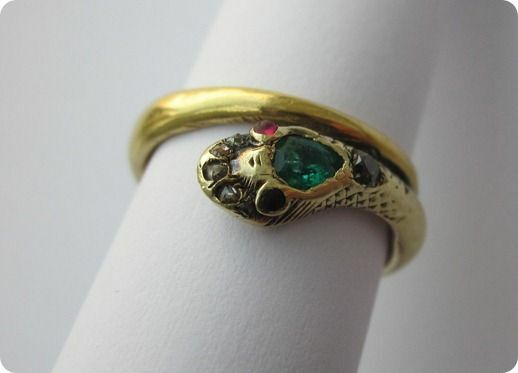 The ring featured an emerald (her birthstone), rubies, and diamonds that were set into a curling snake design. While the reptile may seem like an odd choice, back in the 19th century it was a sign of eternal love and commitment. The Queen’s only daughter, Princess Anne, chose a sapphire and diamond engagement ring by Garrard Jewelers when she became engaged to Capt. Mark Phillips. Interestingly, she selected a sapphire again for her second engagement to Sir Timothy Laurence. Prince Edward, the Queen’s youngest son, proposed to Sophie Rhys-Jones with a two-carat oval diamond that is flanked by two smaller heart-shaped gems. It is also from the British royal jeweler Garrard. Another prince who married an American actress was Prince Rainier III of Monaco. He proposed to Grace Kelly in January 1956 with a Cartier eternity band of rubies and diamonds. However, he soon became aware that other leading ladies in Hollywood were wearing much larger rings. He quickly ordered an additional ring from Cartier. It was a 10.5-carat emerald-cut diamond flanked by two baguettes. I will leave you with the engagement ring of what possibly is the most timeless of all Royal romances. Future French emperor Napoleon Bonaparte gave Rose Tascher de la Pagerie de Beauharnais, later Empress Josephine, a diamond and sapphire ring to show his love and seal their engagement. The tear-shaped stones set side by side, are a style known as Toi et Moi (you and me). The design signifies the union of two souls into one. What ring is your favorite? I lean toward smaller and simpler — the Grace Kelly probably suits me best! I enjoyed this so much. Thanks for all of your hard work and research. Thanks for the research and pictures. I love seeing the preference for colored stones and unusual settings. I remember reading a book about DeBeers years ago attributing the preference for diamonds for engagement rings to their marketing campaign, “A Diamond is Forever.” This slogan cemented the idea in the public mind that a diamond is a rare stone to commemorate an engagement, and they are not rare at at all. The rarity comes form the control of the diamond trade. I also like the use of heirloom stones, it is so sentimental. As for the rings, I prefer simple and non-traditional. They’re all pretty, but the prettiest engagement ring I’ve seen lately is that of my own daughter Sarah – it’s a raw, natural diamond (like a dull rock) surrounded by smaller diamonds and it’s so interesting and so her. Great post, this is so interesting. Wonderful post! I love Napoleon’s ring to Josephine! Second to it, I love the look of Lady Elizabeth Lyons’ sapphire with what looks like 4 corner diamonds. Diana’s is steeped in wonderful history (her comment of biggest one on the tray sounds like she was fully aware of her relationship with Charles from the get-go). Megan’s is my favorite, classic diamond arrangement. Thank you for sharing! I love the clothing fashions too. My favorite ring is MINE! I like Eugenie’s! Pretty, different, striking. Of course, I didn’t choose a diamond, either. Laura, I’m loving this series. I think I like Princess Diana’s ring the best. They are all beautiful but hers is my favorite. It is quite nice that Prince William was able to give Catherine his mother’s ring. I think Diana would like Catherine. I love seeing all the pictures you have shown. I especially like seeing Queen Elizabeth and Prince Phillip in the two photos you called swoony shots. Great pictures of them. What a wonderful glimpse into royal engagements. I love Diana’s / Kate’s ring – that sapphire has captured my imagination since I first saw it in 1981. I love Prince William and Catherine’s engagement photo – they look so in love. Eugenie’s ring is beautiful, too, I’d never heard of that colour of sapphire. Truly unique. All the rings are stunning but my favorite is still Princess Diana’s. I am so happy that William gave Kate her ring. What an honor!! Wow…beautiful rings . I like the colored stones instead of just using diamonds! Of course Lady Di’s ring is so iconic. Sapphires are such a classic and romantic choice. Thanks for all the research. Great post. Timely because of the recent engagements and The Crown and Victoria on PBS. 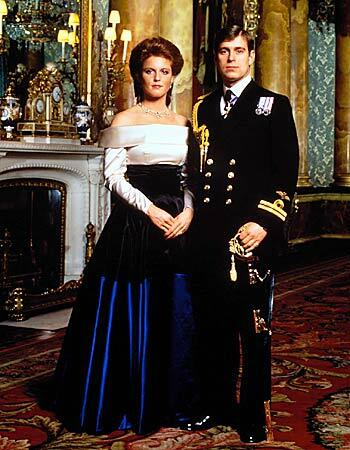 I actually just started a Royals Pinterest board because of The Crown. I thoroughly enjoyed seeing all the photos and hearing about each ring. They’re all beautiful (except for Victoria’s!) but I’d have to say I like the design of Sophie Rhys-Jones’ ring the most. Well, it’s hard to pick a favorite! They are all beautiful. 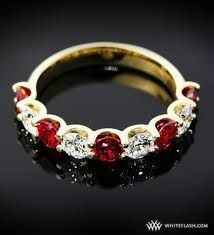 I did not know about Josephine’s ring… it is quite interesting. I think I would pick, err, um Beatrice’s no um Kate’s! Lovely rings. I have been enjoying your royal posts. I also watch the crown and Victoria. I don’t really like big rings, but Di’s ring is my favorite. I thoroughly enjoyed this post, Laura! You researched it so well – and I was particularly fascinated with Queen Victoria and Princess Margaret’s rings. I am so intrigued by how the Royal family have influenced jewellery trends over the years. 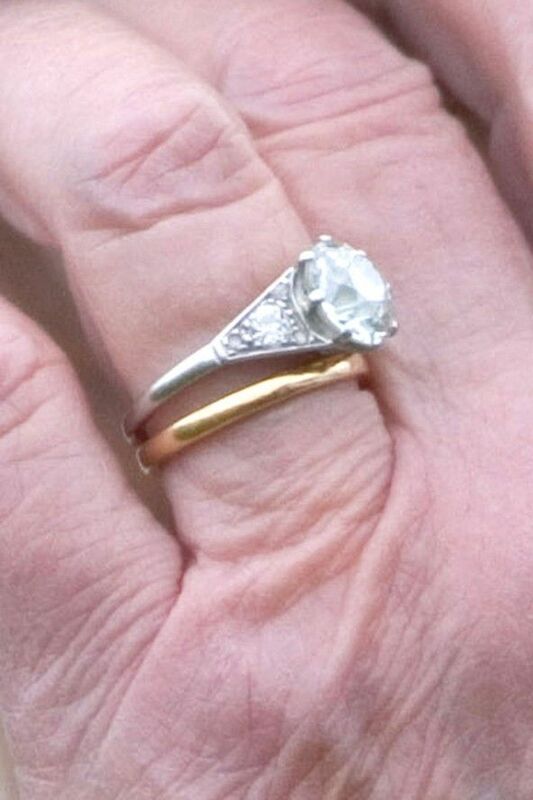 My late mother’s engagement ring was a similar style to HM The Queen’s (albeit on a much smaller sale). 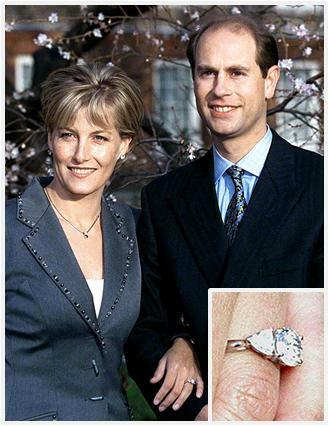 My own engagement ring was a similar style to Princess Diana’s, although again on a much smaller scale. I noticed that the style became very popular again after Prince William gave his mother’s ring to Catherine Middleton. It will be interesting to see how Megan Markel and Princess Eugenie’s rings influence fashion in the coming year! Thank you so much for sharing this post with the Hearth and Soul Link Party. Wishing you a lovely week! What an interesting post! 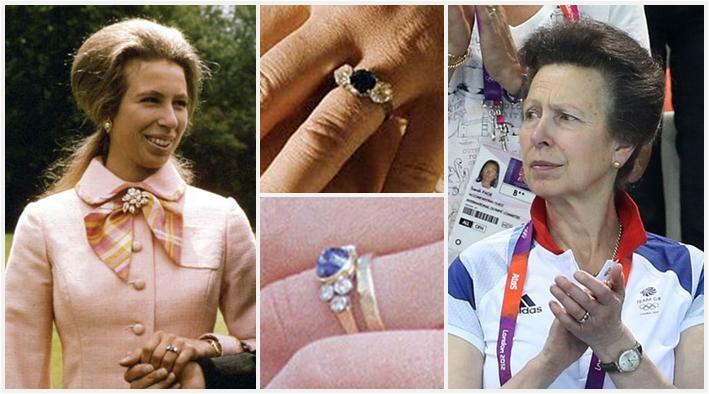 I have never seen Princess Margaret’s ring before. It is stunning and so unusual. Oh. I didn’t know that William had given Catherine his mum’s ring. So sweet. Thank you so much for all the research you did. Diana’s/Kate’s ring remains my favorite as sapphire is my birthstone. Although my life has not showered me with a lot of jewels (or occasions to wear them! ), I enjoy them so much. Years ago, one of my favorite games was choosing 1 ring off each page of a catalog that carried a lot of jewelry! Cheap entertainment. It was so nice to see all the rings and learn the histories. Oh I love that swoony shot of the Queen and Phillip. It was fun learning about all of the different rings. I myself prefer smaller rings as well. Thanks for sharing with SYC. For me it’s a tie between Princess Eugenie’s blush-colored sapphire and diamond ring and Princess Diana’s sapphire and diamond ring that Catherine Middleton now wears. I love the sparkle of all those little diamonds surrounding the beautiful center stones. This was a fun and interesting post to read. I appreciate all the research that you did for it. My favorite was the Grace Kelly green Emerald wedding ring. My least favorite was Queen Victorias snake ring. Thank you for this intresting read.